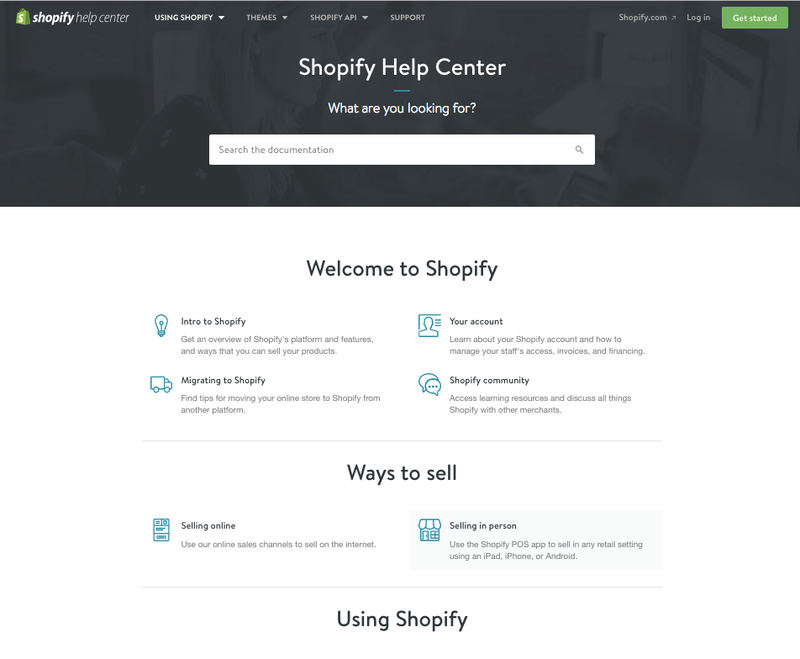 In this post, we’ll take a look at how an FAQ page improves customer experience, tips for building one, and Shopify apps that can help. As customers browse through your store, they may have questions before they purchase products. If you can’t address these questions quickly or through a live chat, you may lose out on sales. If customers have to fill out a support form, those who navigate away from your store may not return, even after you email them back the answer. This is where an FAQ page comes handy. You can address questions that customers commonly ask, and anything else that may not fit into any other area on the store. This is especially true for sales-related questions like the currency transactions are charged in if you sell internationally, details of your shipping and returns policy, etc. Customers will have a better experience browsing your store when they don’t have to wait for answers. In addition, this reduces work for your support team as they don’t have to respond to such general questions. Searchable – If your FAQ page is becoming lengthy, make it searchable so that customers don’t have to look through different sections and questions. Adding a search functionality at the top can create a better customer experience as customers get to what they want more quickly. Sections – Separate out questions into different sections whenever possible. Sections help direct customers to the right area on the page. Sales-related questions – Address questions related to objections first as this can help increase your sales. Call to action – Ensure that you have a call to action at the end of your FAQ page, and on any questions where appropriate. This can give customers next steps and direct them towards a purchase. For example, a call to action for the FAQ page can be to contact your support if somebody didn’t find what they were looking for. 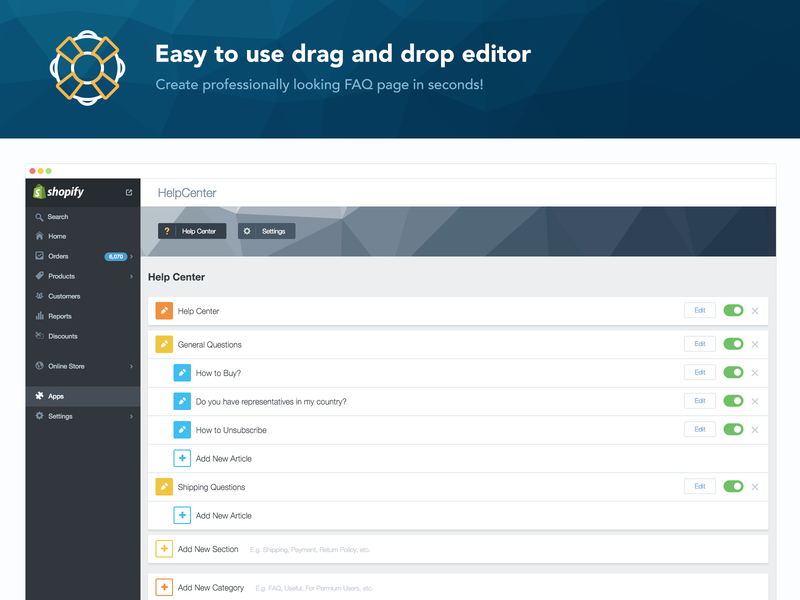 HelpCenter is one of the more popular apps to create an FAQ page on your store. The app helps you create a searchable help-center style FAQ page. The app is free to use. You can create different sections within the app, and add questions within each section. You can also toggle whether to display certain questions or sections quickly. This way, you’re not deleting the questions and inputting them again if you have to take certain questions down for a short period of time. Here’s an example of a store using the app to manage its help center. The EasySlide app adds accordions to your existing FAQ page and product pages so they are not in a long-form text layout. The app costs $3 per month. You can define different sections on the product pages or questions on the FAQ page by adding heading tags. The app also allows you to import reviews on to the product page and display them within an accordion. Take a look at how it works on this demo page. The Product Questions and Answers adds an FAQ section on the product pages along with the ability for customers to ask questions directly on that page. The cost of the app goes from free to $4.99 per month based on the features you want to deploy. The app adds a button on the product pages where customers can ask a question. You can then choose to display the answer to this question on that product page for other customers to see as well, along with sending the asker an email notification. Note that the app is built to display questions on product pages, and not on a separate FAQ page. An FAQ page can help reduce the time customers spend to find answers. This can greatly improve the customer experience as they are not waiting to hear back from your customer support. This is especially true if there are questions that you get asked over and over. When creating an FAQ page, consider putting answers to questions that may be hindering purchases. These can be related to the checkout process, shipping or returns, store currency, etc. Shopify has a number of apps that can help you easily create and enable a help center for your store. Does your store have an FAQ page? What questions would you include on yours? Please tell us in the comments below.